While most people know that they should drink more water throughout the day, up to 75 percent of the US population are estimated to be chronically dehydrated. This isn’t really surprising, with Americans now buying more diuretic soda than water, but this dehydration extracts a heavy cost on both your health and your appearance. Here’s how to drink more water with a simple practice that ensures you keep well hydrated throughout the day. If you follow this easy rule, and start drinking more water throughout the day, it will quickly improve your digestive health and can even help reduce hunger and aid in losing extra weight. Water is vital for cellular hydration, communication and normal functioning; proper digestion, nutrient assimilation and delivery; body temperature regulation; liver and kidney detoxification; immune system function and many other important processes that keep your body healthy and alive. Usual early warning signs of dehydration include tiredness, fatigue, difficulty concentrating, headaches and lightheadedness. Unfortunately, many people seem to misinterpret these symptoms and instead reach for food or medication instead of the water their body is crying out for. Dehydration is also a common cause of poor digestion as your body needs plenty of water for saliva, digestive juices and to keep food moving through your entire gastrointestinal tract. Intestinal cramps may actually be caused not by a specific food you’ve eaten, but rather by a lack of water. Constipation is often directly due to dehydration as well. Clearly, if you are suffering from digestive problems the last thing you want to do is compound the problem by not drinking enough water. Many people confuse being thirsty with the feeling of being hungry. Aside from being a major contributor to weight gain, this can have a very negative effects on your appearance. The internal mechanisms that trigger thirst in your body are actually quite similar to the ones that trigger hunger. With junk foods deliberately manufactured to be highly addictive these days, it’s not hard to see why you might reach for a salty snack instead of a glass of water. Of course, all that salt draws fluids out of your cells and increases dehydration even more within your body. You finally get thirsty, but a soda seems more appealing than water, so you flood your system with massive amounts of destructive sugar, which also stimulates more hunger. And so it goes on. The best way to break this vicious cycle and get the water your body needs to stay healthy is to follow a basic, yet extremely powerful rule — the Drink Water First rule. The key to increasing your water intake is to use your hunger, not initially as a signal to eat, but as a signal to drink more water. To follow the Drink Water First rule make a pact with yourself right now to always have a glass of water before you eat — no exceptions. The Drink Water First rule is so simple that many people discount it. If you want a healthier digestive system, a slimmer waistline and a higher level of health and energy then you won’t be one of them. Let’s look at what makes this rule so powerful and why drinking water just before a meal is one of the best times to hydrate your body. The first reason is that, as explained, it’s very likely that you are actually thirsty rather than hungry. By drinking a big glass of water just before you eat you can satisfy that thirst and feel much less like overeating in the following meal. Once they implement this rule in their lives, many people find they naturally lose weight, even without deliberately dieting. They’re just not as hungry as they used to be. The Drink Water First rule helps to reduce snacking as well. 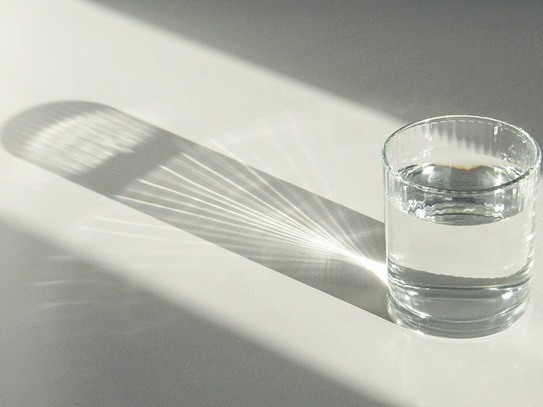 By having a glass of water first, before reaching for a snack, you’ll often find you don’t need it after all. It was just misplaced thirst and you feel fine after drinking your water. This study even found that drinking water before a meal for 12 weeks resulted in significant weight loss in overweight people. The researchers praised the simplicity of this method and said it had the potential to make a real contribution to public health. 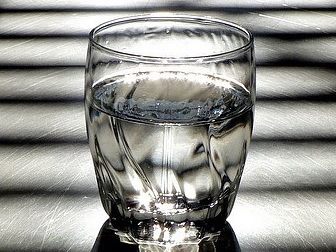 Drinking a big glass of water right before a meal is also a great way to improve the digestion of your food. It prepares your gastrointestinal tract for the meal to come and enhances gastric secretions for proper nutrient breakdown. Importantly, you’ll be much less likely to drink large amounts of liquid during or just after your meal as well. Drinking beverages during a meal generally isn’t recommended as it can dilute stomach acid and impair digestive processes. By always following the Drink Water First rule you are getting into the habit of drinking the water you need each day on autopilot. This is extremely valuable as dehydration can quickly catch up with a person who doesn’t have a strategy like this for remembering to drink water regularly. Once you make this a strong habit you won’t have to remember to have water when you’re busy or wonder whether you’re really hungry or just thirsty. If you feel either hunger or thirst then you always have a big glass of water first. If you don’t like plain water then try these 4 tips to change the taste and improve its beneficial effects even more. Squeeze the juice of a fresh lemon and add it to a glass of water. This simple beverage is actually a potent detoxifier with many health benefits. The best time to have your lemon water is first thing in the morning, soon after you wake up and before you eat. Combining this morning ritual with the Drink Water First rule can dramatically improve both the way you look and the way you feel in a few short weeks. Raw apple cider vinegar is an excellent digestive aid and is full of many natural health boosting compounds. It can do wonders for your skin and is also helpful for reducing hunger and promoting higher metabolism for natural weight loss. Add a tablespoon of organic apple cider vinegar with the mother like this to a big glass of water before every meal of the day and drink it all before eating any food. For those who find it hard to kick the soda or sugary drink habit, both terrible for your digestive health, try this similar tasting but much healthier alternative. First get a bottle of sparkling water and a low sugar fruit concentrate, like this antioxidant rich black cherry. Mix the two in a glass with ice for a great tasting replacement to soda that actually does your body good. Throughout the centuries, drinking water from natural sources like streams has been one of the primary ways that humans receive minerals, particularly the difficult to get trace minerals. Modern water supplies remove these but there is an easy way to put them back in. ConcenTrace mineral drops, derived from the great salt lake of Utah, are concentrated ionic minerals with the sodium removed. It is a rich source of vital magnesium, but also contains 72 ionically charged trace minerals that are highly soluble in water. These trace minerals are needed for your body to run at its best and many people report an increase in their energy levels when they start taking ionic minerals in their water each day. In the morning and before bed is the best time to take trace minerals. They are also particularly good after exercise to replenish lost mineral stores. If you’re thirsty, it’s best to drink before eating. Saliva should be what moistens the food in our mouth. Washing each mouthful you eat down with a drink minimizes its important functions. Too much liquid taken into the stomach during a meal also dilutes the digestive juices that are supposed to be working on breaking down the food. Worse still are high sugar colas or acidic coffee that can really interfere with the digestion process. Drinks and high liquid foods like certain fruits should be had before meals, not with them. They can then pass quickly through the stomach rather than getting trapped in it with the digesting food and messing up the whole process. A small amount of water or a healthy herbal tea like peppermint with a meal is probably fine. But gulping down a super sized soda or large processed juice with lunch or dinner is likely to impair digestion and lead to flatulence later on. The massive amounts of sugar in these drinks will also probably spike your insulin levels and increase the chances of storing more body fat. Drinking plenty of water between meals, before and at least an hour (preferably two) after, is good for digestion and therefore for preventing flatulence. It can also help you to eat less and lose weight, as many of us confuse dehydration with hunger. If it’s not time for a meal but you feel like a snack, try a big glass of water first. It’s very possible you were just thirsty rather than hungry. The Drink Water First rule is so simple yet it’s an incredibly healthy habit to get into. Start today before your very next meal. Get a water pitcher, preferably with a special filter to remove toxins like this, and a favorite glass and keep them on the kitchen table or on your desk at work. Make sure they are highly visible and much easier to reach for than snacks or sugary drinks. Really focus on following the Drink Water First rule and having a big glass of water before each meal for the next 2 weeks. Before long you’ll find drinking more water becomes a natural habit, and one that can have a dramatic effect on how good you look and feel each day. I have found this to be very helpful to me.as I suffer from so much gas.its a wonder. I haven’t blow up.i am very tired after only being up 2 hours.in the morning.i am defiantly going to try the drinking water before meals ect.thank bayou so much for this. Gas is a constipation issue that is caused by consuming Bread and meat in excess while devoid of greens.